In the time it takes you to open a can of Sloppy Joe mix you can whip up your own homemade Joe sauce to make this kid-friendly, soon to become a favorite family dinner of Homemade Sloppy Joes Over Cornbread Waffles. There was a time when I used to buy my Sloppy Joe mix out of a can from the grocery store. Not that that’s a bad thing, but I’ll tell you what…once you make your own (which doesn’t take much more time than opening a can), you’ll never go back! 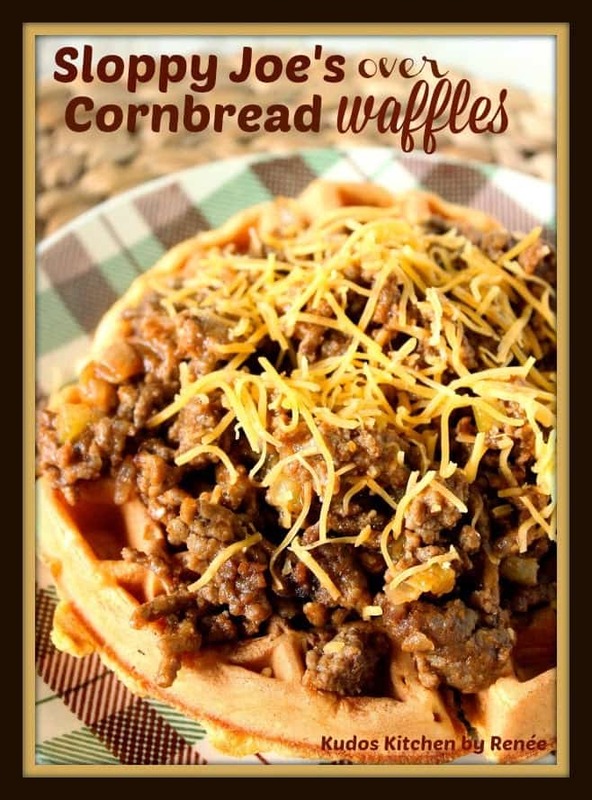 Homemade Sloppy Joes Over Cornbread Waffles will soon become a family favorite! 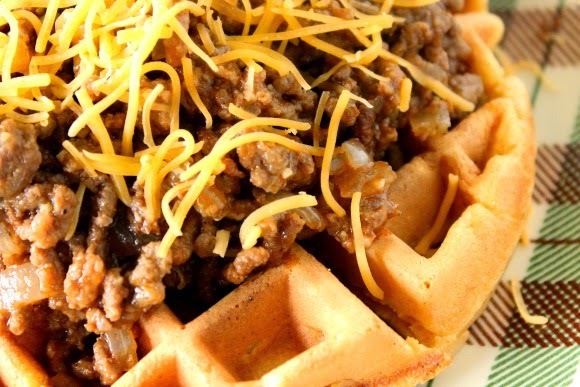 And, what better way to serve your homemade Sloppy Joe’s than over than a homemade cornbread waffle? Of course, a bun is good too…but why not give your family a little something unexpected? It’s a fun meal that is sure to please the entire family! Thanks for the Homemade Sloppy Joes Over Cornbread Waffles, Mom!! **Please Note – The printable recipe card with detailed instructions and complete ingredient measurements for making Homemade Sloppy Joes Over Cornbread Waffles is available near the end of this post. As a weeknight time saver, why not consider making the waffles on the weekend when you have more time and then freeze them to use during the week? 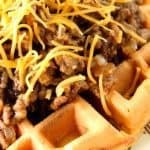 To make this meal of Homemade Sloppy Joes Over Cornbread Waffles even more kid-friendly, (yeah, I’m helpful like that), you might want to drizzle some maple syrup and melted butter over the cornbread waffles (not mentioned in the recipe) before topping with the sloppy Joe’s, for an extra layer of flavor. I LOVE that idea and wish I would have thought of it sooner. 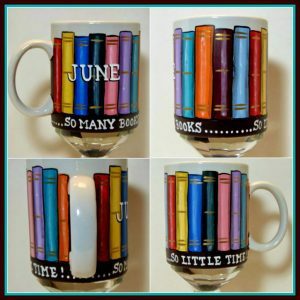 LOL Ah well, next time…Or at least that’s my story (book humor), and I’m sticking to it! In the time it takes you to open a can of Sloppy Joe mix you can whip up your own homemade Joe sauce to make this kid-friendly, soon to become a favorite family dinner of Sloppy Joe's Over Cornbread Waffles. In a large skillet, brown the ground beef over medium/high heat. Reduce the heat to medium/low and stir in the remaining ingredients. Serve on a bun or over cornbread waffles (recipe follows) and top with cheddar cheese. Preheat waffle iron while you make the batter. In a large bowl, whisk together the flour, cornmeal, baking powder, sugar, paprika, salt, and pepper. In a small bowl, whisk together the milk, eggs, oil, and chiles. Stir the wet ingredients into the dry ingredients until blended. The cornbread waffles can be made in advance and frozen if needed. To reheat, pop them into a toaster, or heat in a 325-degree oven on a rack to keep crunchy. large skillet, cutting board and chef's knife, wooden spoon, measuring cups and spoons, waffle iron, large bowl, medium bowl, cooking spray (for the waffle iron). 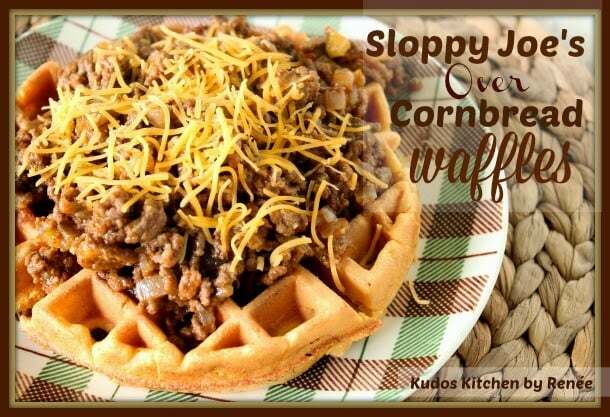 I hope you’ve enjoyed this recipe for Best Ever Homemade Sloppy Joes Over Cornbread Waffles as much as I’ve enjoyed bringing it to you!! Should you have any questions regarding this recipe for Homemade Sloppy Joes Over Cornbread Waffles, or anything else you see on my site, please don’t hesitate to contact me directly, or leave me a comment in the comment section below. It is always my distinct pleasure to get back to you with a reply just as soon as I possibly can! Cornbread waffles would be delicious for dessert! I can see them now topped with tons of fresh berries and whipped cream! we do this with chili – never thought to do it with sloppy joes. YUM! My kids would flip out over this. This would definitely surprise my crew. Sounds like fun! Sloppy joe on a waffle?!! How do you come up with these amazing concoctions?! I've never had anything hot like a sloppy joe over a waffle. Interesting! It looks good. This is brilliant! Simply brilliant! Kudos! I never would have thought of that! That's just awesome!! love it!